Will Blue Laws Make For A Melancholy Super Bowl Sunday? : The Two-Way Fans hoping to toast a Giants or Patriots Super Bowl win in Indianapolis will need to stock up early on their champagne supplies — Indiana bans the sale of alcohol on Sundays. A patchwork of similar laws are in effect across the country. Indiana laws bar all carryout alcohol sales on Sundays, leaving Super Bowl revelers in the lurch in their quest for any 11th-hour 12-pack the day of the big game. 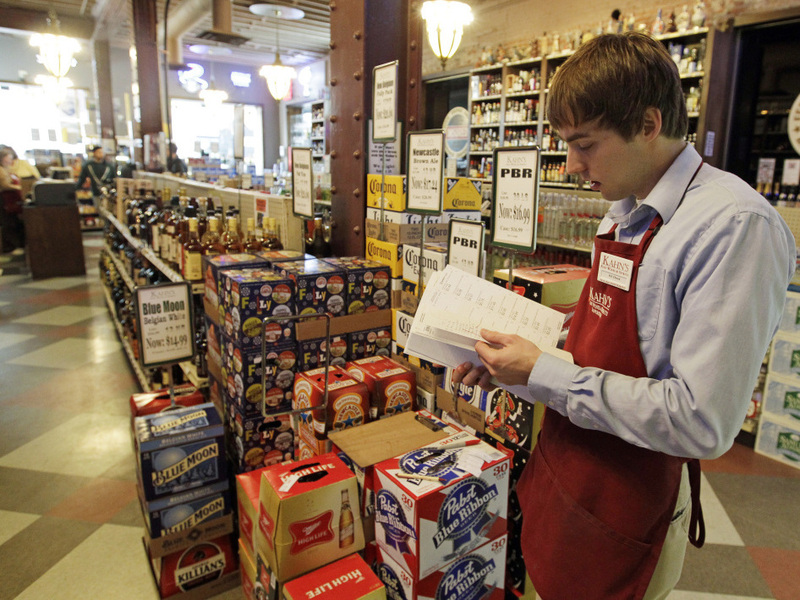 At Kahn's Fine Wines and Spirits in Indianapolis earlier this week, Bill Cheek was putting labels on cases of beer. Fans lucky enough to toast a Giants or a Patriots Super Bowl win in Indianapolis this weekend will need to stock up early on their champagne supplies. Indiana is one of just two states that ban the sale of beer, wine and liquor at stores statewide on Sundays. A patchwork of blue laws are in effect across the country. Named for an antiquated use of "blue" meaning "moral," blue laws prohibit various kinds of activities on Sundays, such as operating a business or buying a car. The sale of alcohol is one of the few blue laws still in effect in many parts of the country. Some prohibit Sunday alcohol sales in certain areas or times of the day, and others allow the sale of beer and wine but not spirits. Fans at the game Sunday or in Indianapolis restaurants will be able to get beer and other alcoholic beverages — Indiana's blue law doesn't bar restaurants, bars and sporting venues from serving alcohol on Sundays. But Indiana and Connecticut don't allow any carryout alcohol sales at any time throughout the whole state on Sundays, but that could soon change in Connecticut. As WNPR's Jeff Cohen reported for Morning Edition today, Connecticut Democratic Gov. Dannel Malloy will ask the legislature to approve a series of liquor law changes in its upcoming session, including one that would allow package stores to sell alcohol on Sundays. "He says it's pro-consumer and pro mom-and-pop," Cohen reports. One of the main reasons proponents want to allow Sunday alcohol sales is because of the revenue they say it could bring in. Malloy thinks it could mean $570 million a year in liquor sales now lost to people driving across borders for their booze — or simply not shopping for it at all on Sundays — and up to $11 million in tax revenue from that. Cohen spoke to a package store owner Dominic Alaimo in Enfield, Conn., who said he's tired of watching his business leave the state. "It's millions of dollars that are leaving — plus the other shopping. They fill their gas tanks, they buy food, they buy cigarettes," Alaimo said. "Many package store owners have opposed Sunday liquor sales because they say it would require them to stay open an extra day without seeing much increased sales activity." Many states use what's called a local option to allow counties and cities to make up their own minds on the issue. In November, more than 100 localities in Georgia voted for the ability to buy alcohol on Sundays for the first time in about a century. Reuters reports that around 500 more will vote up or down in the 2012 election. (There were no other issues on the ballot last year in most of those places, and Sunday spritzers weren't enough of a priority to create a special election.). Other states have recently gotten rid of the blue law altogether. Back in 2008, NPR's Linton Weeks noted that Colorado permitted the sale of hard liquor on Sundays for the first time in decades, right before another big event — that year's Democratic convention. Washington, New York, Virginia and Arkansas have all expanded the Sunday sale of liquor in recent years. The Distilled Spirits Council of America, a trade group, counts 37 states that allow the Sunday sale of spirits — not including wine and beer — meaning 13 others have some limitations. "There was never much chance of getting Indiana's 'blue law' suspended, just this once. A spokeswoman for Gov. Mitch Daniels, Jane Jankowski, said the issue was never raised." An inability to buy beer isn't the only challenge some Connecticuters will face on game day. NPR's Joel Rose reported earlier this week that fans are split between the Giants and the Pats both chronologically — if they were Giants fans before the Pats came to the area in 1960 — and geographically. "If you live southwest of this line and have the ungodly idea that a chowder is red with tomatoes in it, you have no business having a New England zip code," they say.